Recently, an analysis of over 30,000 online reviews of medical practitioners confirmed poor customer service is patients’ biggest frustration. In fact, according to this research, 96 percent of patient grievances are due to disappointing customer service, while the other four percent cite misdiagnoses. Today, patients are customers. When they walk through your doors, they have higher expectations than ever before. 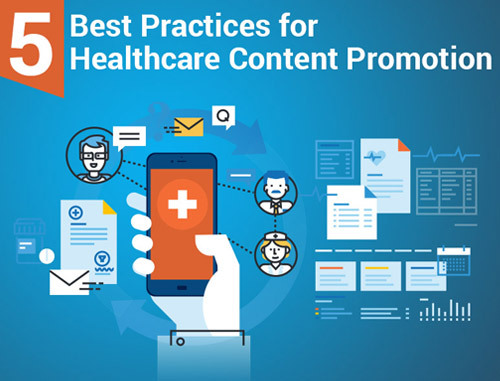 Moreover, they will not hesitate to utilize the power of social media and tell the world if their experiences with your medical practice are not as expected. 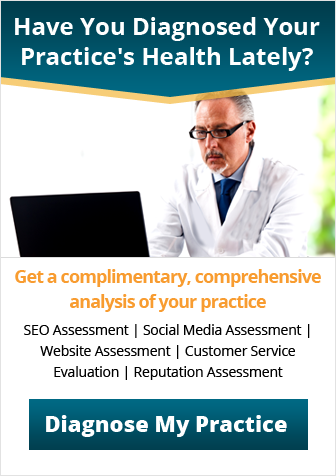 It is time for medical practitioners to benchmark and deliver high-quality service as desired by patients because that is the only way to sustain yourself and grow your practice. Why is the patient experience important? Value-based performance is forcing medical practitioners to achieve financial objectives along with improving the patient experience. This is because patients who have an excellent experience are more likely to return and recommend your practice to others. However, if they are not happy with your service, they will run to your competitor and post negative feedback about your practice on social media. Happy patients, on the other hand, will be immune to competitors and help increase your revenue and profitability. Besides, patient satisfaction is necessary to obtain positive feedback on review websites. 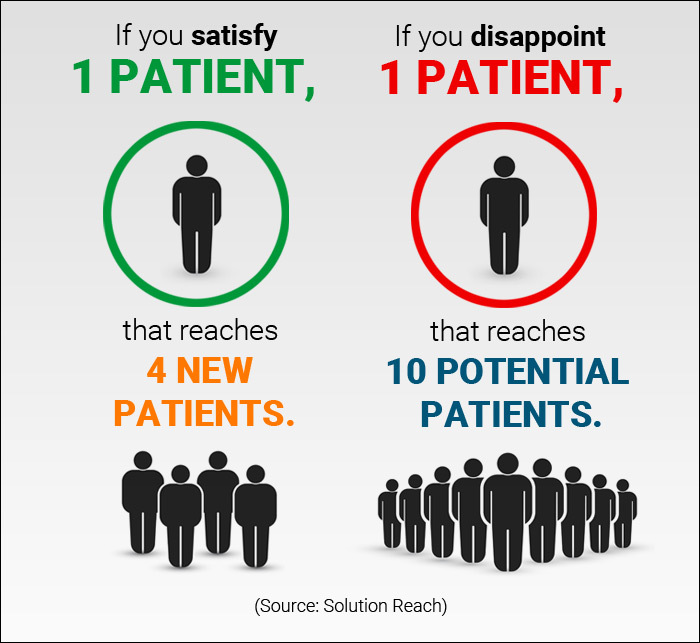 Unfortunately, most medical practitioners do not understand what satisfies a patient. They assume that the biggest factor is the quality of treatment. What they do not understand is that patients have no way to measure the quality they are receiving. Instead, patients rely more on how the doctor and the medical staff respond to their emotional needs. 1. Make your practice look engaging: Patients will form opinions about your practice before they even meet you. The first impression will start with a well-designed, patient-friendly website where visitors can learn about your practice and the range of services you offer. Also, don’t forget to include interactive tools that allow patients to schedule appointments and communicate with your staff through email. 2. Respect your patients: Your staff must commit to giving patients the attention they deserve throughout their visit. Right from the moment the patient arrives for a scheduled appointment until the time he/she leaves, your staff must provide excellent service. 3. Improve communication with patients: Patient communication begins with answering phones with enthusiasm and being willing to answer all of their questions. Your staff should never say no to a patient, even if they don’t have the answer. When patients come in for their scheduled appointments, your front-office staff should make eye contact with them and smile. Be reassuring and comforting if the patients seem restless. 4. Optimize the appointment process: You must try to establish a well-managed appointment scheduling system that has professional templates. You must keep the office phone lines open during lunch hours. This can be done by rotating staff schedules and making sure someone is always available to take phone calls. 5. Be prompt in answering and returning phone calls: Don’t keep patients on hold for more than 30 seconds, and don’t keep transferring calls from one person to the other. You must be sure to return phone calls and emails within a standard time frame. Your staff must be aware of the established time frame for responding to questions. Also, never make patients wait for their scheduled appointments. Check them in and let them know how long they are likely to wait. 6. 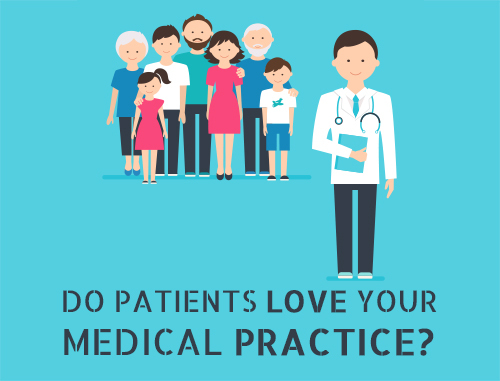 Simplify the billing process: Patients who are happy with your practice’s billing process are more likely to pay their bill in full, return to the practice and recommend your practice to their family and friends. To provide a seamless experience, your staff should be trained to discuss and collect payment, provide an accurate estimate of the bill and explain the components of the bill to the patient. 7. Establish a process to obtain feedback: One of the most frustrating situations a patient can run into is having a bad experience but never getting the chance to vent concerns. Without the patient’s feedback, your practice will assume everything is fine while the patient is searching for a new medical provider. According to published reports, 55 percent of patients who had a bad experience but received a satisfactory resolution returned to the same practice. So you must keep asking for feedback and give your patients the opportunity to voice their concerns either in the office or soon after they leave. Your staff must be trained to handle negative feedback with an apology and a solution and incorporate that feedback into your operations. 8. Don’t rush through your appointments: As much as possible, try to spend quality time with your patients and listen carefully to their concerns. You must make them feel heard and sit down with them during appointments. Don’t make your patients repeat the same information over and over. You can consider electronic medical records to resolve these redundancies. Making eye contact with the patient as much as you can will indicate that you are paying attention and are engaged with the patient. Don’t keep looking at your watch, and don’t stand with one hand on the door as if you’re trying to run away. When you are in a hurry, your patients may feel anxious and unwelcome. 9. Find ways to follow up with patients: Receiving generic wellness plans would make many patients feel a stronger bond with their medical practitioners. While you can’t act as patients’ daily health coach, you can get them engaged by sending them generic healthcare material between appointments. 10. Be accessible at all times: Patients are often disappointed by the inability to communicate directly with their doctor between appointments. Direct communication with their doctor will help increase patient satisfaction. You can consider exchanging secure messages and building systems that open the lines of communication between you and the patient. This will not only encourage long-term relationships but will also result in better health outcomes. 11. Foster a caring attitude: Everyone in your practice must operate with a patient-first approach. Your front-desk staff is your first point of patient interaction, so their attitude toward patients must be positive and healthy. Attitude is everything, and when your front desk is indifferent, your patients will simply leave. 12. Cultivate long-term relationships. Most medical practitioners are trying to juggle too many patients in a limited time, which may make the staff tired and stressed. However, a patient will only be happy with your practice as long he or she has rapport with your staff. You must train and encourage your staff to send thank-you cards and birthday wishes to patients. Or just a brief phone call to follow up on medications and recovery can foster long-term relationships. Make sure your staff is trained on delivering high-quality service along with a positive patient experience. 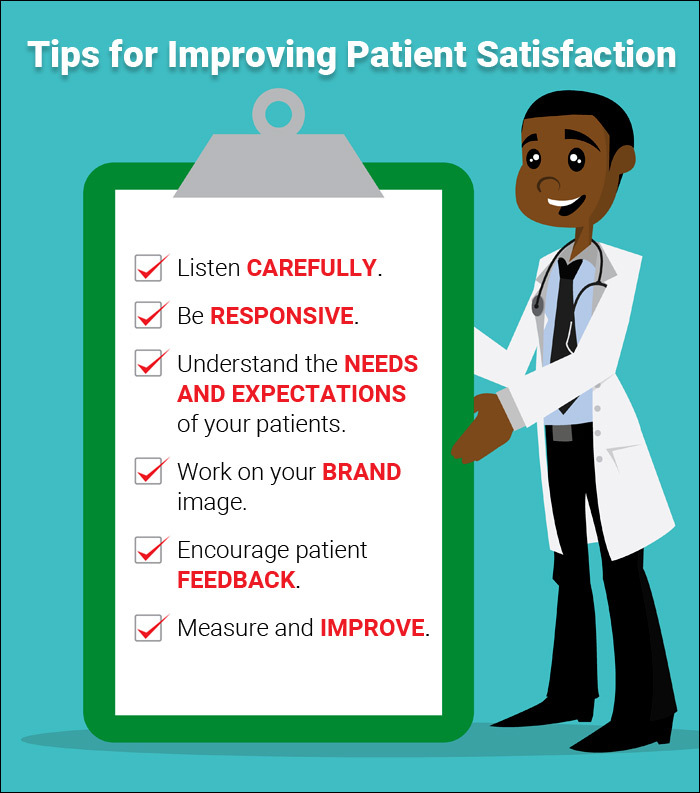 You should also encourage your staff to suggest ideas for improving patient satisfaction within your practice. 13. Focus on patient education: Providing your patients with the knowledge they require to improve their health and adopt a healthier lifestyle is critical to the patient experience. Your patients will feel valued and cared for when they leave your office with more knowledge than they had when they arrived. Studies have shown that patient education can result in patient retention, which leads to increased patient satisfaction and fosters long-term relationships. 14. Create an environment of caring: The greatest improvement in patient satisfaction will happen when the patient feels cared for. You can easily accomplish this kind of positive patient relationship by small gestures, such as addressing the patient by first name, greeting them with a smile, making eye contact, paying attention to what the patient has to say, etc. Even offering a box of tissues if a patient is distressed will go a long way in increasing your patient satisfaction level. 15. Differentiate your staff: Your patients may find it annoying when they are surrounded by medical professionals but are not sure whom to approach when they have a concern or request. This may become even more frustrating when the patient approaches one of your staff members only to be directed another member. The easiest way to differentiate your team is by providing different-color scrubs so that your patients can easily recognize an RN from a PA.
16. Empower nurses: Nurses have a critical role in patient-centric care and improving the satisfaction level in patients. Nurses who are more independent will provide better patient care as they feel empowered in their work. You can consider creating a staffing committee to allow your nurses to collaborate for better patient care and give them the freedom to improve the patient experience. 17. Improve the atmosphere in your practice: Cleanliness is an indicator of quality, and focusing on sanitation can improve overall patient outcomes. Also, noise, lighting and quick-paced movement may not encourage relaxation. Therefore, you must think about upgrading your décor to create a more welcoming environment and tackle the issue of restlessness. You can try to help patients relax by installing quieter equipment and wearable devices to nurses, especially at night. 18. Protect your patient’s confidentiality: Most of the topics surrounding a patient’s visit to your practice are of a sensitive nature. Therefore, your staff needs to understand and respect the surroundings in which they are speaking with a patient and try their best to preserve confidentiality. 19. Observe the patient: During your meeting with a patient, keep looking for signs that may indicate that the patient is not satisfied. If you happen to sense any such sign, be proactive in responding to your patient’s doubts and questions. If your patient has a complaint, and even if you don’t know the solution, find someone who can help the patient. Empathy is critical as it will convince the patient that you are listening and care about their well-being. 20. Don’t set the bar too low: Don’t set the bar too low by comparing your service only to other medical practitioners. 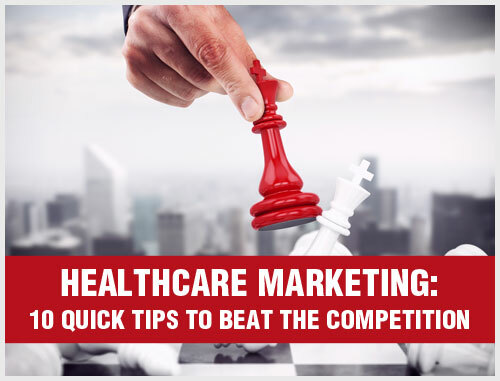 You should learn about strategies of companies outside the healthcare sector that provide the highest quality of customer service. So you must set your customer service standards against the best in service-intensive industries. By providing consistently satisfying experiences, your medical practice will win patient loyalty and become a provider of choice. Patients will spread the good word, which will bring in more patients. Providing a quality patient experience is the most powerful growth strategy. 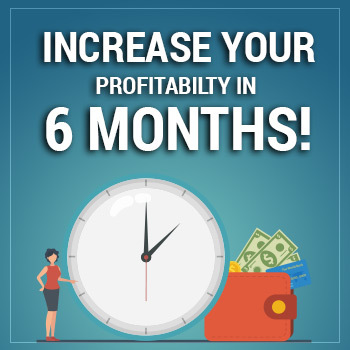 This is because when you are providing an exceptional patient experience, you will eventually reduce the costs of doing business. Also, your staff will find the positive work climate more satisfying, which in turn will help reduce staff turnover. At the end of the day, patient satisfaction is about pursuing excellence. It demands attention and commitment to do better each day. 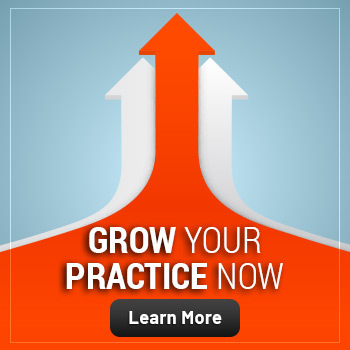 Medical practitioners who embrace a culture of patient satisfaction enjoy significant growth in revenue as well as practice size. If you have any questions or need any help in improving your patient satisfaction level, please feel free to call Practice Builders and receive a complete assessment of your customer service strategy. Our team of experts will offer you actionable tips to improve patient satisfaction, attract new patients and grow revenue.